With so many different style and size variants to choose from, buying an aquarium is more exciting than ever, but it can also be more perplexing. How can you be sure that the design you choose is the right one for your fish? How practical will it be to maintain, what options will it offer you, and how will it fit into your home? Since the cost of a new aquarium can run into hundreds of pounds, it's important to think carefully before you make your choice. The most important thing to get right is the size of your aquarium - and, crucially, the size of its surface area. This is the place where gas transfer takes place between the water and the air, so it's essential for maintaining a healthy environment. If you have less than two square inches of water surface per cubic inch of fish, you'll need to provide extra aeration, and you'll also need to do more frequent water changes. It'll be harder to get devices like protein skimmers to work effectively. Bear in mind that this is an average statistic, too - some species of fish have higher oxygen needs. Despite what you may be told by some unscrupulous sales people, there is no such thing as an aquarium so small that the water doesn't need to be changed. In fact, it's easier to keep water chemistry stable in a larger aquarium. For this reason it can be a good idea to buy a larger tank if you plan to keep more delicate fish. Some fish need a lot of room to move around in, even if they're not all that big, and will suffer from stress-related illnesses (which can be fatal) if kept in too small an aquarium. Others will feel safe only if there are enough of them to maintain control over all their territory, so in some cases you will need to buy more fish if you choose a larger aquarium - watch it carefully to see how much of it they actually use. You should also think carefully about how large your fish are going to be when they reach full adult size. 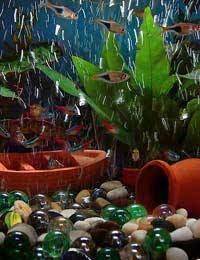 The aquarium style you choose can affect the amount of light your fish - and plants - get, so think carefully about their specific needs. If you're keeping a nocturnal species it may not matter as much, but if you want to maintain a healthy plant-based ecosystem then you'll need enough surface area to let in sufficient light from the hood. You'll also need to think about where your aquarium is going to be positioned in your home and how much sunlight it may be exposed to. Too much sunlight focused on a small aquarium can heat the water dangerously. For this reason it can be a bad idea to position a tank in the middle of a room where it will be difficult to provide it with shade. It's easy to fall in love with the idea of having a huge aquarium, expanding your fish keeping options, but think carefully about what you can reasonably fit into your home. You should also bear in mind the weight of such a tank when filled with water. Is your floor sturdy enough to support it? What will support the tank directly? Sometimes an aquarium design will incorporate a metal or wooden cabinet of suitable strength, which can be a practical place to keep associated paraphernalia such as food and nets, but if you're providing your own supporting piece of furniture, make sure it can take the weight. It's also worth thinking carefully about any other household pets you have - and children. The latter may try to pet the fish and end up hurting them, or poisoning them if, say, they have soap residue on their hands. Cats predate on fish and can be quite clever about opening the latches on aquarium hoods - the best solution to this is to have two latches which need to be opened at once, a suitable distance apart. Of course, if you're keeping a talented creature like an octopus, you'll also have to make sure that your hood can't be opened from the inside. And remember that small pets like hamsters can fall into fish tanks and drown. There are many stunning and innovative aquarium designs out there, from octagonal columns to 'windows' incorporated in dividing walls, but if you buy something like this, remember that you'll need to be able to clean it and to retrieve any fish who die. An unusual aquarium design can sometimes be more trouble than it's worth. Think carefully, choose wisely, and you'll have many happy years to look forward to, watching your fish explore their new home. How many fish could I keep in a 54 litre and tank and what type of fish? I am thinking of starting a community tank.